Tripping in 7/8 time signature! Thanks to all those who works for this project! Lovely that Flen is seen in a positive way. 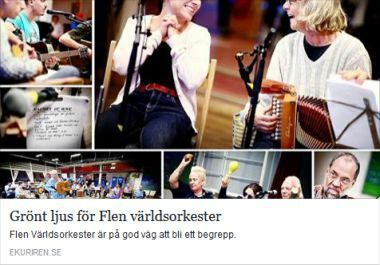 A nice reportage on SVT about FlenVärldsOrkester! 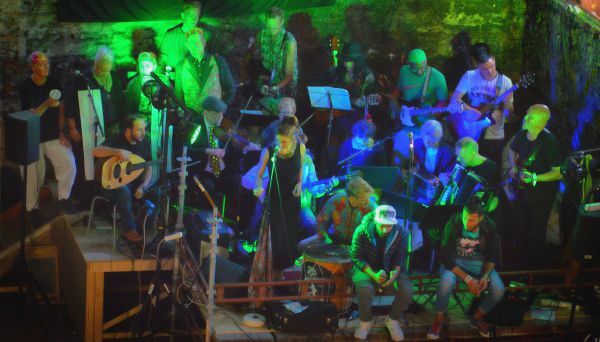 Nice article about the Orchestra! 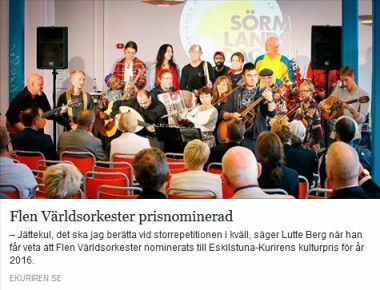 FlenWorldOrchestra has received the award as the year's Sörmlänning (incredible!). This same day, Mohamed Al Rass has just given us a nice "video trailer" about our live-recorded CD, which will be released on October 3 during the release concert in Amazon(check out the link). As if this were not enough, we've run through the entire program during today's rehearsal! It feels like we are on track for the free concert on Tuesday, October 3rd. 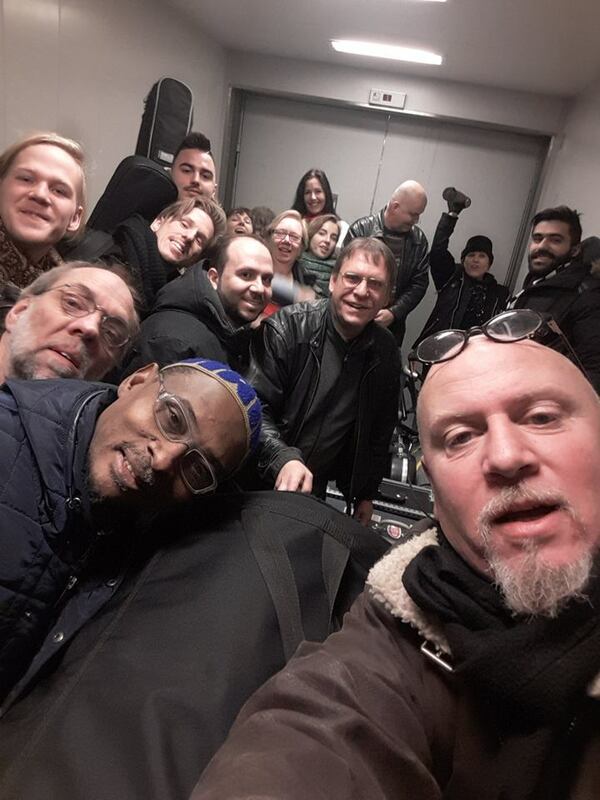 "I still think (although it happens almost every Tuesday) that it's amazing to see how the whole orchestra comes for the rehearsel after a long day at work, at SFI, at school etc, and gives all they have for the FlenWorldOrchestra. Today, we were over 30 people who worked on the arrangements, "faught" with a high F# or a low Eb, listened to the other musicians searching for a common sound. Lovely that new musicians continue to join us! We work so that we can give you all a wonderful evening on October 3rd when we release our first CD! " Soon our CD! October 3, the album will be released. Here´s a little teaser. If you like it you are welcome to share 😎. Order for only 100 kr! Thank you Mohammed Al Rass for the video. 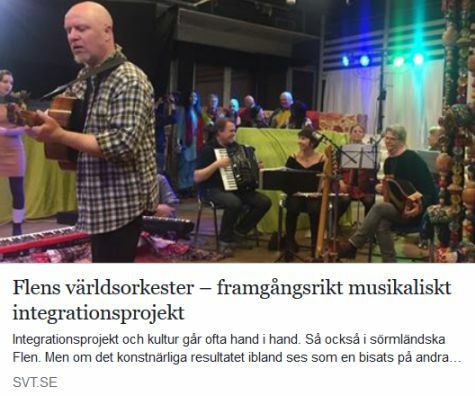 "FlenVärldsOrkester was today in Vingåker and played at the Plurality Festival. It felt really good and right to perform for such an important issue. Sounds uncredible but it is still necessary (in 2017!) to remind people that the world should be a place where we can freely choose to live the life that suits us best. 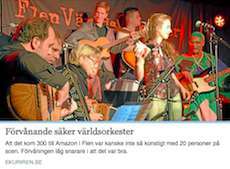 "We want to thank everyone that came to the concert and listened to us on Saturday in Flen. We are happy that so many ended up despite the unusual concert time (14:00) and we really felt the support from the audience. 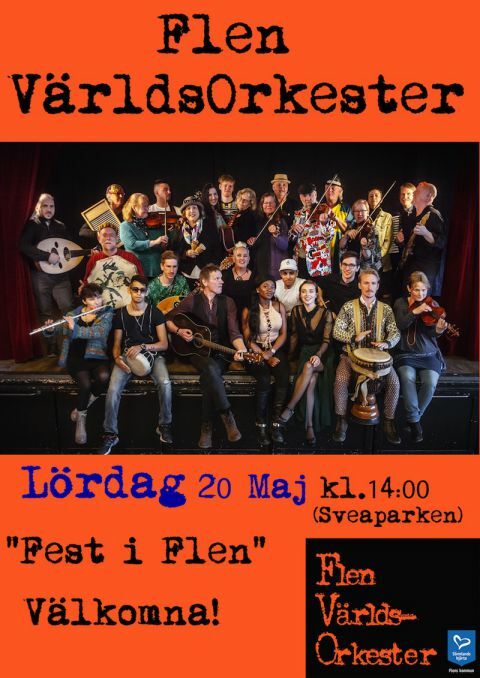 Next concert will be Vingåker and their Diversity Festival! Parade and concert will be our program. Welcome you who do not have too far to go! " "It becomes something special when the people that wants our concert are colleagues. On Saturday, the theater company "Jycklarna" celebrated 30 years (!) of activity and for the event they wanted the entire(30 persons) World Orchestra in place! It is truly an honor and privilege for us, as it is not so common to be booked by other cultural workers. It was a little extra fun also for the reason that none of the guests had the brightest idea of which band would play there. When the curtain went up it was clear to everyone and the lovely audience lifted the orchestra and helped us thru the successful concert! 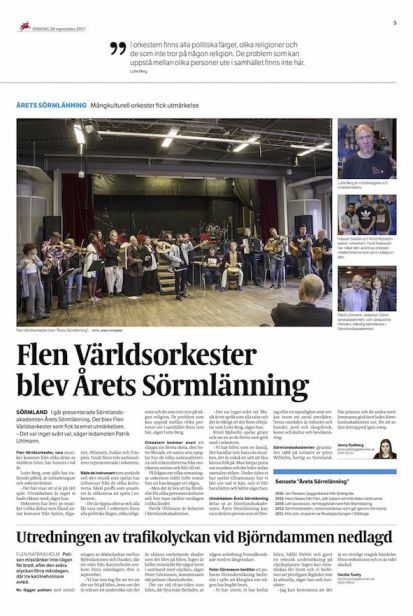 We thank Jycklarna for the trust :)"
"Great to wake up on Sunday morning and see that Aftonbladet made a very nice (five-page) reportage about FlenWorldOrchestra. It feels right towards all the people who are working for the Orchestra that there is some positive response even at the national level . Thanks Martina Strand Nyhlin and Johan Kindbom for doing the reportage. Now we are approaching our rehearsals for the next concerts. The mixing of our first album is in full swing (Ola Swenson works hard) and we are hoping for a late spring release. Last but not least, The Culture House courses in film, dance, theater, music and visual arts are running since last week. And then we also have the World Youth Orchestra! Have a lovely Sunday folks!" "A really special afternoon yesterday on Amazon! As usual, I was unsure whether someone would appear on our opening of The Culture House. To my and many others' joy, the people from Flen showed up again and filled Amazon to the width. You could feel it in the air that a place where everyone can come and try out theater, dance, music, film and visual arts really was welcome! The E-kuriren came and wrote about it all. This will be a fun trip! 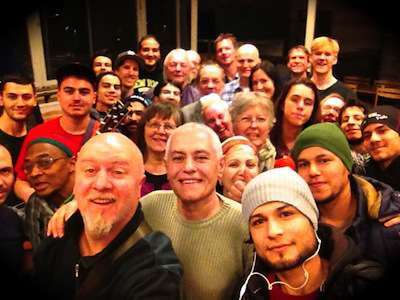 Come and check out :)"
"It has been a wonderfully intensive period for us in FlenVärldsOrkester. Our second recording weekend is over and the CD is now ready for mixing, mastering and anything else that has to be done before a CD can be sold. It has been a great experience that definitely lifts the WorldOrchestra! 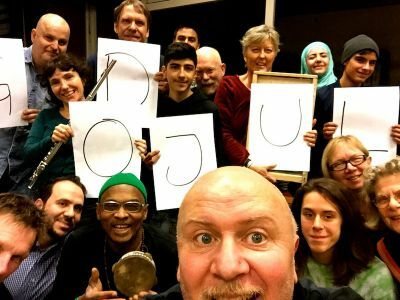 We especially thank Ola Swenson, sound engineer and friend who managed to do a live recording of 30 joyfully playing musicians :) We hope to release the record this spring. 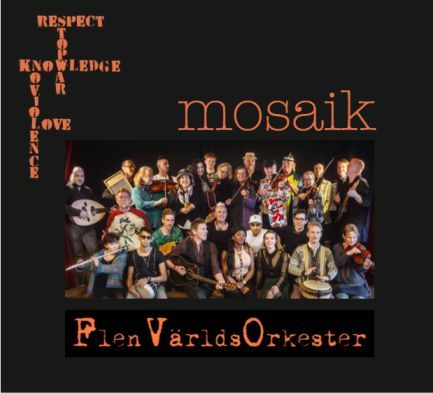 At the same time, a "delegation" from FlenVärldsorkester of 6 people has been around on an elderly tour (scenkonst sörmland) for 2 weeks (2 concerts a day) that has been very rewarding to us and I hope and believe that the people we played for felt the same. Yesterday, this wonderfully intensive period ended up with a lunch concert in the Performing Arts Sörmlands Concert Hall (eskilstuna). Looking forward to new adventures :)"
A happy new year gift to us from filmmaker Mohamad Alraas! 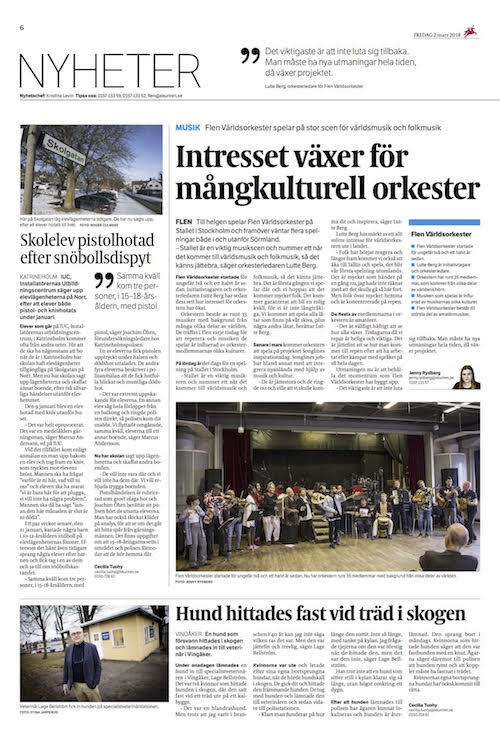 1) FlenWorldOrchestra has had the municipality's trust for another year. 2) The CD recording will take place sometime in January-February. 3) The YoungWorldOrchestra has also been given extended life. 4) The Arts Council has said yes to our TheCultureHouse project. Great news early in the morning. 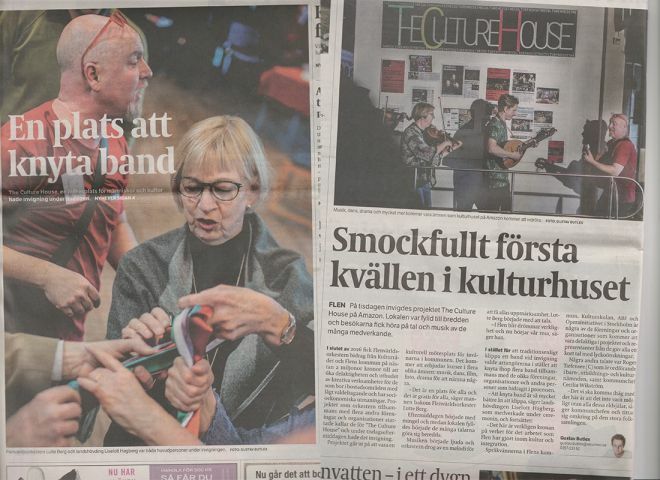 We have been nominated for this year's Cultureprice from Eskilstunakuriren! It's obviously great to be one of the four candidates. Unbelievable to be there together with the other very well-known candidates. 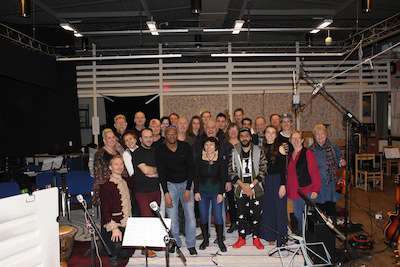 Our World Orchestra is only one year old! Thank you very much for the nomination. Eskilstunakuriren think, like we do, that a birthday concert is worth writing about. Now it has been one year since the first rehearsal and a big free concert is to come. May it become a tradition! I, as an orchestra leader, feel great gratitude for the entire orchestra, and all the people that helps us beyond the stage lights. Gratitude! 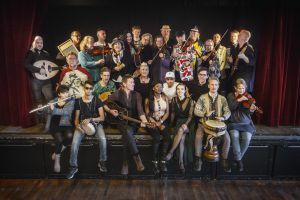 We are happy to present the first Flen WorldOrchestra videoclip! Now Flen World Orchestra is starting to play good and"tight". The gig in Masugnen yesterday was a lovely experience and the audience gives us the strength and will to work, constantly searching for new music and to strive to increase our musical level. Without the audience every group or musician is left with himself and then the will, the dreams and the desire to practice simply slippes away. Now we will take a small summerbreak and get going again on Tuesday 26 July. Then there will be concerts in Nyköping, Katrineholm, Oxelösund, Gnesta and Örebro .... before the big concert on our birthday party in early October !!! More on this to come... Have a nice July to everyone! Flen World Orchestra continues to develop very quickly and organizations are calling for concerts. The next concert will be in Flen on the big stage May 21 at 1pm and the day after we drive to Södertuna Slott. 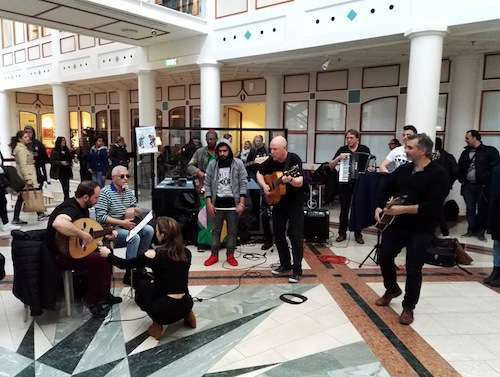 Today, however, I would like to consider another aspect of the project that has a great importance even if I never write about it: the possibility to participate, free of charge, in my workshops on guitar and piano. It is a great joy and a privilege to be able to give a touch of joy to the people who want to learn an instrument. 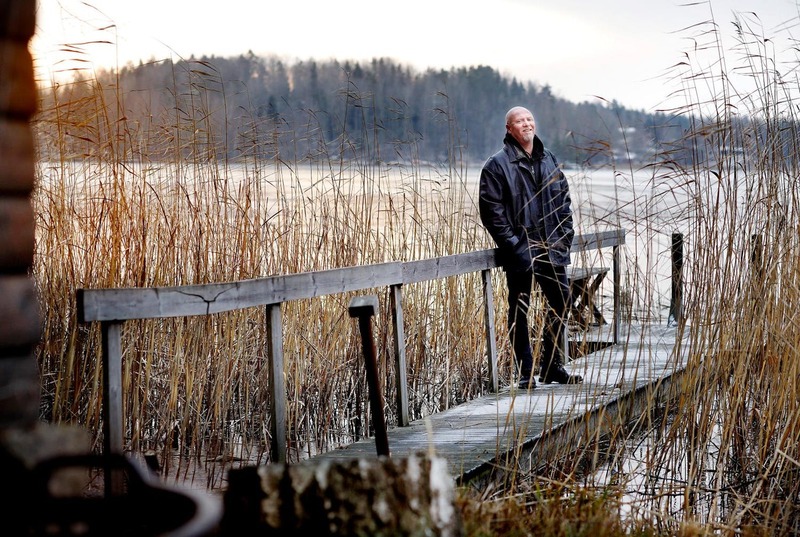 It is easy (especially if you are new here in Flen) that you just go and wait for your asylum or that you have not been able to find your self comfortable in our Swedish system. I dream of an Amazon open from Monday to Friday where everyone can come and choose from music, theater, dance and video / picture / painting. An open house for anyone who wants to try out. One way to fill your life with something good and healthy for the soul. In the photo Angela, Leo, Linnea and Saleh that symbolizes what we want! 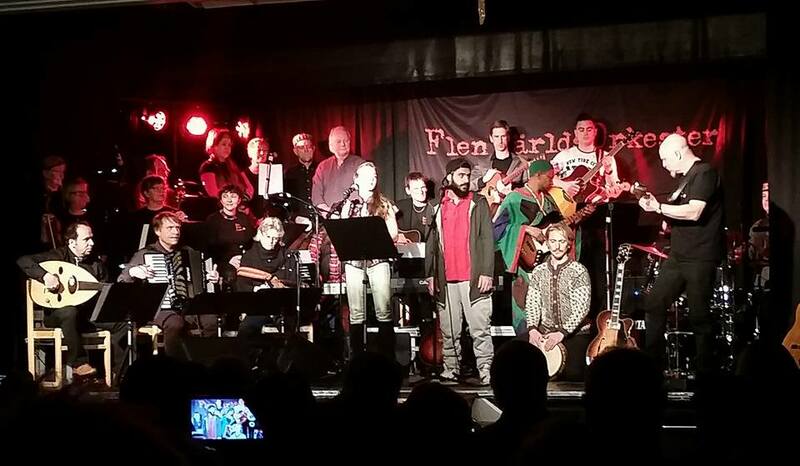 FlenWorldOrchestra today had a really lovely concert in Haninge Culturhouse. 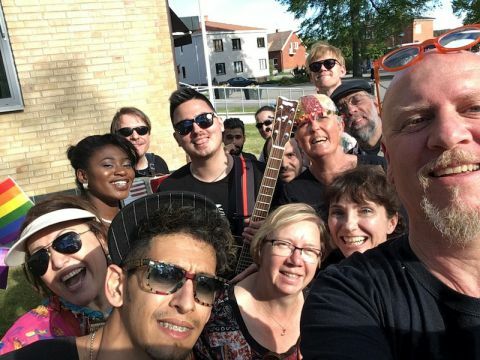 Earlier we "stormed" two secondary schools in Haninge with something of a surprise concert (to attract young people to the afternoon concert) and it was great fun. Our flashmob was a success and most of the students came to the concert. Once on stage we played with energy and the audience responded positively! Sharing our experience with other municipalities is really good and necessary. MUSIC UNITE! Brilliant rehearsal today! I brought an arrangement of "La Partida" (a South American classical written by Victor Jara) where the orchestra really have much to deal with. Our new keyboard player Fadi improvviserade with a Qanun sample while the strings went from pizzicato to arco in divided parts. 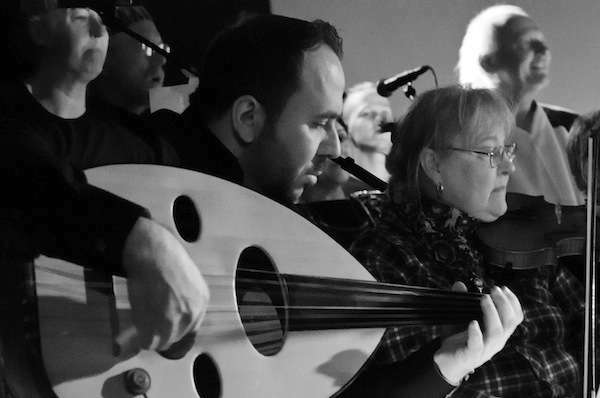 Flute, oud and accordion comes in with an other part in sparkling sixteenths, while guitars and charangon play sweet arpeggios! Drums, percussion and bass starts pushing the band forward after sixteen-measure pause .... It's unbelievable that you can get it all together on a single rehearsal. FlenWorldOrchestra starts to really play together! Next week we will go to Haninge and play. The first of the two videos is soon ready and mixed. 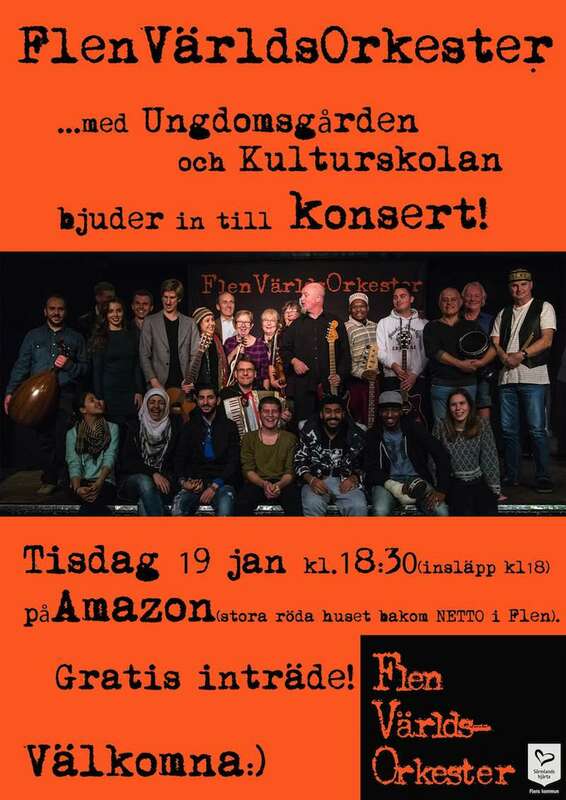 We start to work on our two documentaries(director Mohamad Alrass) next week while we prepare our SouthAmerica medley, do the mixing of our second video, preparing new songs for the upcoming concerts at Södertuna Slott, Masugnen Dunker, Katrineholm, Södermanlandsdagen in Strängnäs and Open Up in Örebro. Maybe we will play at Fest i Flen also... if they want us! Lovely experience yesterday at Saga Salongen in Torshälla! The complete FlenWorldOrchestra were their and played the hell out of their instruments. It's a bit special when the orchestra and the audience meet each other. Feels like creating a dialogue between us and the audience, and that's the most important thing for all of us that plays music. Torshälla also gave us a standing ovation! Personally, I want to thank all the musicians in the orchestra for their great playing and the audience for the way they welcomed us. Photos by the very skilled Irene Vasberg Now we continue our rehearsing and on Tuesday we will deal with South American melodies. Now FlenWorldOrchestra takes a little well-deserved break. We have worked hard and with pleasure with video recording (available soon) while we prepare our upcoming concerts. 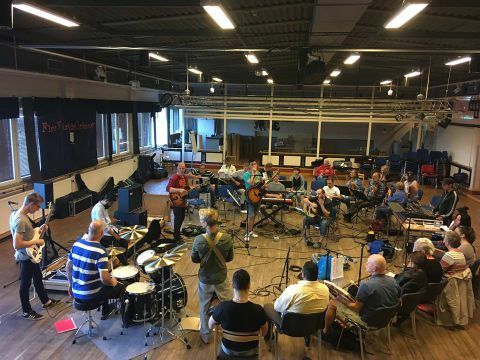 It's nice to see that people comes to my guitar and piano workshops (Monday and Tuesday at 11.00-12: 00), and that more people join our WorldOrchestra! Unofficially, I can say that we seem to be nominated for a national award in the category "Innovative project" and "Outstanding educational deed". Now we wish you all a Happy (and good) Easter !! We start "running" again after Sörmländska Easter holiday. Now I'm wonderfully exhausted! The audio and video recording we had in the weekend is over and it feels like we have done a good job. 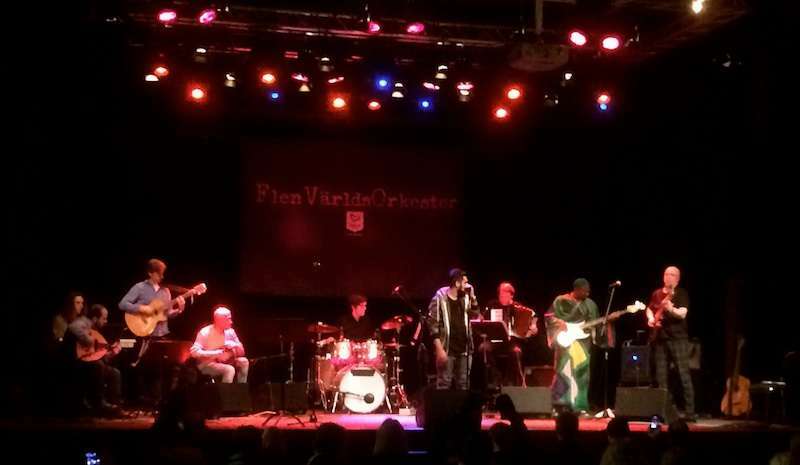 Flen World Orchestra played well yesterday at the Kulturhuset in Stockholm. After a panel discussion (with, among others Alice Bah Kuhnke and Marika Lagercrantz) about of what must be done to help newcomers to integrate culturally the FlenWorldOrchestra stept on stage and played. Things happen .... Emilia (one of our singers) has been given a role at the Opera. Hasan (our rapper) understand that punctuality and physical presence is the most important thing in the music business (it does not matter how good you are if you are unreliable, at the end nobody will call you). 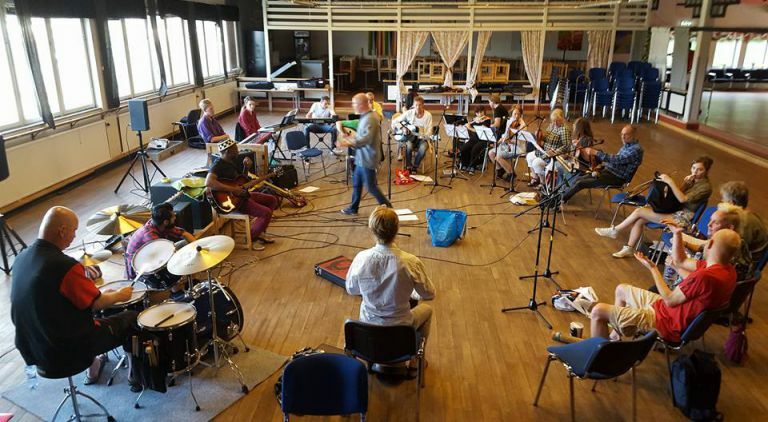 The Orchestra is now rehearsing with professionals spirit (our new song "Flenjoik" was ready in 1 hour!) And it's tangeble that we are approaching 12-13 March when we will play and record our videoclip. 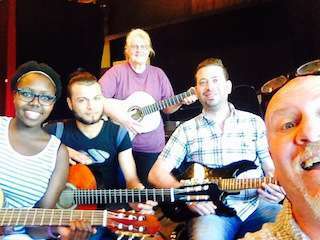 We get new members every week for the Orchestra and for the guitar course. At the same time we have plans, in collaboration with the School of the Arts, about transforming the Amazon into a cultural center (with a capital C) for all cultural workers (Swedes and immigrants) and for those who do not necessarily work with culture, but who wants to start with such as dance, theater or image / video. We have also begun on a plan that includes national and international cooperation with similar projects around the world. 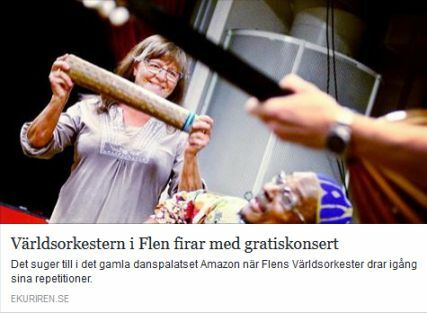 It is difficult to comment on what happened yesterday on Amazon in Flen. An incredible influx of people who wanted to participate, support and check out what "their" orchestra had to offer. We in the orchestra felt that something magical was happening. It's great to play when you feel the support from the crowd ... and the thunderous applause! My applause goes to the entire Flen :) Here are some pictures from the concert. Thanks for the pictures Bettan. Now the whole Christmas / New Year / Epiphany celebration "finally" ends! I hope everyone had a great vacation from work or school :) Talking about myself I had nice dinners interspersed with long and lovely arranging / composition sessions for the World Orchestra. We also had special rehearsels with different sections of the orchestra during the festivities ... so we have not been sitting and "waiting for better times," so to speak! Now it's the final rush to go before our debut concert on January 19 and it will be really fun! You're welcome!!! Autumn 2015 has been fantastic for our newborn Flen World Orchestra! The curiosity and support that we feel from everyone warms our hearts. 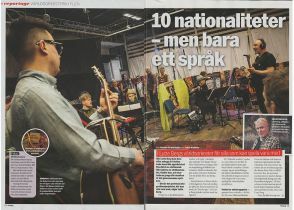 Magazines (e-kuriren, glimten, sörmlandsbygden), Sveriges Radio (Swedish Radio) and, not least, SVT1 (Swedish television) has all become aware of our WorldOrchestra. P4 has invited us into their recording studios for interviews and some live music. Flen municipality know follow us with curiousity and observing eyes (thanks Roger, Inger, Cecilia, Berit ... and everyone else in the municipality). Thanks to ABF who supports us. 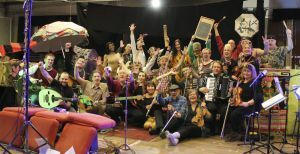 In the near future (Feb / March) FlenWorldOrchestra will record videoclip. Mobile recording studio from Stockholm comes to Amazon and the video piece is a collaboration between local filmmakers and lighting designers from the big city. Should be exciting! Now we take a small vacation from the rehearsals and get going again on 9 January. We wish you all a MERRY CHRISTMAS !! !